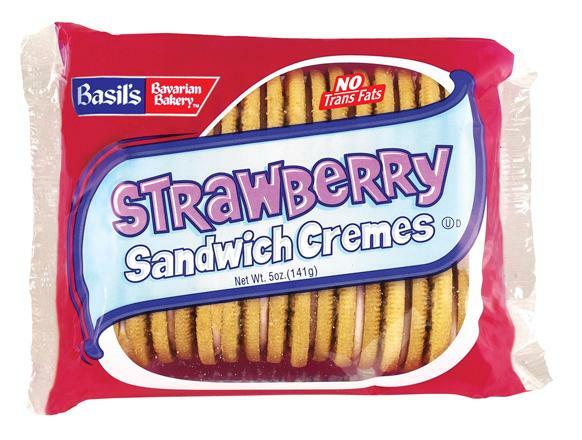 The 5-ounce Basil’s Bavarian Bakery Strawberry Sandwich Cremes from Biscomerica Corp. offers a tasty treat with no trans fats. A serving size of three cookies has 130 calories, 20 grams total carbohydrates and 5 grams total fat. The Basil’s Bavarian Bakery is a company brand name offering a variety of flavors, price points and sizes of cookies, all designed with bright, contemporary packaging at a competitive price. The company’s baking facility is OUD Kosher certified and has received an “A” grade from the British Retail Consortium. The product is manufactured in a facility that processes soy, wheat, milk, peanuts, pecans, almonds, cashews, walnuts, macadamia nuts and other tree nuts. Biscomerica Corp. is a member and supporter of numerous vending industry organizations, including the National Automatic Merchandising Association (NAMA), and is a Friend Donor Club contributor to the NAMA Endowing the Future Campaign. The company is also a board member of the California Automatic Vending Council and other state and regional vending associations.